Are you a regular laptop user? If so, you’ve probably noticed that your laptop can get quite hot while you’re running intense programs or multiple applications at once. Not only can this excess heat be uncomfortable, it can be dangerous for both you and your laptop. 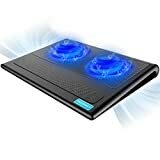 Finding the best laptop cooling pad for your setup will make a world of difference in your computing experience. Using the best laptop cooler for your preferences will ensure that you are comfortable and experiencing the best that your laptop has to offer in performance. That’s why we’ve put together this buyer’s guide to help you navigate the endless choices available. We’ve selected the best laptop coolers and we’re excited for you to see the great options that we found. So let’s dive in! Why Buy a Laptop Cooler? 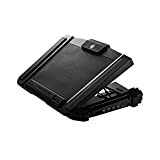 As mentioned above, the purpose of a laptop cooler is to keep your computer performing optimally while also providing you with greater comfort during use. Whether you like to use your laptop at a desk, on your lap, or curled up on the couch or bed; there is a perfect laptop cooler out there for you. Overheating issues are quite common in laptops. 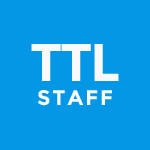 The average laptop is not designed to run high-intensity programs or applications for long periods of time. Even with the help of a thermal paste, you’re bound to find yourself in need of some extra cooling power from time to time. That’s where a laptop cooling pad steps in to save the day. Using a quality laptop cooler will also keep you from incurring any heat rash or other heat-related issues such as burns. A laptop may not seem hot enough to burn you, but as heat builds up in your tissue you become less sensitive to it; making it more difficult to gauge whether or not you are being burnt. Check out the article “Laptop Heat and Radiation Injuries…” for more info. How big is your laptop and how much cooling power will you need? How much noise are you willing to deal with in exchange for air flow? These may not seem like terribly important questions now, but they quickly begin to matter when you’re packing for a trip or trying to get comfortable using your laptop in bed, or at a desk. This slim and highly portable laptop cooler is one of the very best options available for laptop users like yourself. It’s comfortable too. It’s ergonomically designed and provides two levels of height adjustment for maximum comfort and utility. 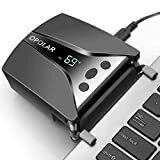 It has 3 integrated fans with up to 1100 RPM each, which are powered by a super convenient USB port connection. If you find yourself in need of extra USB ports, this model’s integrated USB hub is sure to come in handy too. The 3 fans are ultra-quiet models which provide an impressive 65 CFM airflow. This should be enough to keep your 15-17” laptop cool and functioning optimally. 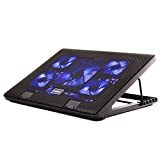 This futuristic looking laptop cooling pad is one of the best choices around if you’re looking for something with high end performance to keep your laptop safe and your lap comfortable. The metal casing design syncs heat away from your laptop, while the 4 internal fans provide excellent air flow to your 15-17” system. It is USB powered and provides an integrated, extra USB port to replace the one in use to power the device. Its ergonomic design includes ‘feet’ to adjust the angle of your screen to reduce neck and back pain as well. The Thermaltake MASSIVE TM has 2 internal 120MM fans with dBA noise ratings of just 31; which isn’t too loud. The max RPM for these 2 fans is 1300, which is excellent for larger laptops that require a great deal of air inflow. This cooler provides up to 61.27 CFM. Cooler Master are some of the best in the business when it comes to cooling systems for pcs and laptops. The NotePal X3 is no exception. The high performance 200MM fan does a highly sufficient job of cooling important components on even the largest laptops. As an added bonus, this model of laptop cooler will also keep you at optimal working temperature. By this, we mean that it has an extra vent along the front that is specifically designed to keep your hands and lap cool as well. It works well with both height and angle options. The Otimo Laptop Cooling Pad is one of the very best laptop coolers for those on a budget. This 5-fan cooler boasts air volume of 74.35; which is considerably higher than similar models. This increase in air inflow definitely makes a big difference in its cooling capacity. If you’re looking for ‘extra’ features, the Otimo won’t let you down. It has extra USB ports, a brilliantly blue LED light display, and an extra-long connector cord for your convenience. This laptop cooler completely skips the pad/platform and plugs directly into the side of your laptop. Think of it as a more direct injection of air inflow. It’s easy to install and is a simple plug-and-play setup that is ready to use immediately. You can choose the settings that you want for your fan speed and the temperature that you’re trying to achieve; with your choice of 13 speeds. This makes it a lot easier to find a balance between functionality and the amount of noise that you’re prepared to deal with. The Belkin CoolSpot Laptop Cooling Pad is a small, whisper-quiet device that is extra efficient. The AirFlow Wave design creates and maintains an evenly dispersed air stream. This superior cooling technology won’t distract you while you work, so you can ensure maximum efficiency with minimal interruption. USB-powered, the Belkin CoolSpot is pluggable directly into your laptop, and sits comfortably with its ergonomic design. Do you have a large laptop that produces a lot of heat? If so, you may need more than a couple of fans which is where devices like this cooling pad from Vanble come in handy. It may not have a fancy name, but it’s colorful and will definitely keep your laptop cool. 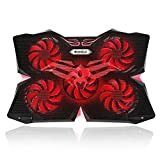 Beneath the metal mesh of this cooling pad, you’ll find five fans capable of speeds up to 1,400 RPM with two on each side and one in the middle. This gives you a full range of coverage, and it’s suitable for laptops from 12 – 17 inches. The cooling pad is adjustable with two settings and a non-slip baffle to keep your machine from scooting off the pad. If you’re a gamer, you’ll dig the general design, but if you’re not, the style may be a bit wild for your tastes. Each fan is illuminated by an LED light as well but don’t let that turn you off if you feel lights are distracting. You can control the fans and lights independently, and there are two USB ports beside the controls on the back. Vanble’s cooling pad has an interesting design that’s sure to turn some heads, and those fans definitely put out some air. You’ll want to keep the size of your machine in mind however as some consumers reported issues with 17-inch and widescreen laptops. This cooling pad is available in with Green or Red LEDs and comes with a 1-year warranty. Thermaltake is a popular brand among PC builders, and they make some outstanding cooling accessories as well. Our top option from the company is the Thermaltake Massive 20 RGB, a cooling pad that lives up to its namesake in more ways than one. This cooler is a beastly at 18.54”L x 13.95”W x 1.83”D and tips the scales at a little over 3 pounds. It’s well built with steel mesh covering the entire front which allows the air to flow freely and helps keep your laptop cool. The massive 200mm fan has something to do with that as well with speeds between 600 – 800 RPM. Cooling isn’t the only noteworthy feature on the Massive 20 either as it’s adjustable and puts on quite the show. You’ll have a choice of three angles with 3, 9 or 13 degrees and a vivid 256-color RGB system. There are five modes to choose from with their system including Pulse, Blink, Wave, RGB Spectrum and Full. Obviously, if you have a smaller laptop, there are more affordable (and portable) options out there, but for larger machines, it’s tough to beat the Massive 20 RGB. The lighting is top notch as well, and the pad is surprisingly quiet for its size. This cooler comes with a 3-year warranty, and smaller sizes are available if you prefer LED to RGB lighting. Consumers that prefer laptops over desktop PCs sometimes type at odd angles as they don’t require a desk. If you want a versatile pad with more features than most, the CM Storm SF-17 is your best bet, and it’s the most adjustable pad on our list. The high light of the CM Storm SF-17 is the height range with four angles and retention tabs to make sure it stays put. While it’s compatible with laptops up to 19 inches, take that lightly if you’re going full tilt with this one. That said, it’s built like a tank with an excellent cable management system. This cooling pad also has more ports than most with a total of four which are located next to the step-less fan dial. The 180mm fan is quite capable, and the red LEDs look good along the side and front. Overall, it’s a clean design even if it’s a little bulkier than competitors due to the ergonomic design. The only knock we have on the CM Storm SF-17 is the price as it’s more expensive than your average cooler including some with RGB systems. There have been a few quality control issues as well, but nothing out of the ordinary and all are minor. This cooler comes with a 1-year warranty. With only two fans, the TechNet N5 cooling pad may seem like it’s not as productive as our other options. 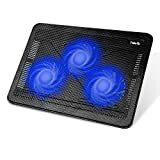 Well, that would be a mistake as those fans are powerful and the pad is engineered for efficiency thanks to the wavy design on this one. TechNet’s N5 cooling pad is rather simple from a design standpoint. There are two 120mm fans beneath steel mesh which cool your laptop and a non-slip strip to keep your machine in one stop. The fans are quiet, and there’s an extra USB port on the back along with a power switch and button to operate the fans and lighting separately. At a little over 1.5 inches thick, this is one of the easier cooling pads to take on the road, and the price is right given the performance. Unfortunately, there are no speed controls or adjustments on the N5 although it holds most laptops between 12 to 16 inches.